Texting is one of the greatest technologies of our time. According to Nielsen estimates, over 350 billion text messages are sent every month worldwide. But from the moment texting first became prevalent in our culture, there have been ongoing debates about the safety of texting while driving. Numerous studies have shown that just talking on a cellphone while driving can significantly increase the risk of an accident. But texting while driving poses an even greater hazard on the highways by diverting the driver’s attention away from the road and the wheel for dangerously long periods of time. According to a study by the Virginia Tech Transportation Institute, texting while driving makes a driver 23 times more likely to crash. In fact, the National Highway Traffic Safety Administration (NHTSA) recently stated that driving while texting is six times more dangerous than driving while intoxicated. The costs of all this distracted driving are sobering. According to distraction.gov, 3,328 people were killed, and 421,000 were injured in 2012 from automobile accidents involving distracted drivers, with texting being listed as the number one distraction. The government website also reveals that, according to the University of Michigan Transportation Research Institute, A quarter of teens respond to a text message once or more every time they drive. 20 percent of teens and 10 percent of parents admit that they have extended, multi-message text conversations while driving. Additionally, the website states that 10 percent of all drivers under the age of 20 involved in fatal accidents were reported as distracted at the time of the crash. The site also claims that the under-20 age group has the largest proportion of drivers who were distracted. 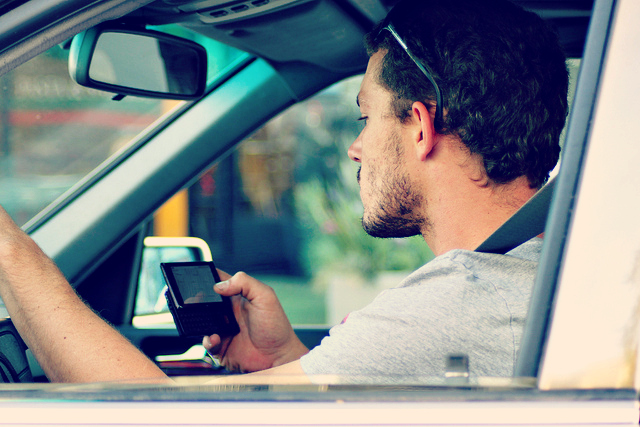 According to a 2012 survey by the NHTSA, 94 percent of drivers surveyed said that driving while texting should be banned. In terms of the appropriate fine for the offense, the drivers felt that the fine should be a minimum of $200. That being said, of the more than 6,000 respondents age 16 and older that participated in the NHTSA phone survey, nearly half admitted to answering incoming calls when driving and 25 percent said that they are willing to place a call on all, most, or some trips. Put those statistics into perspective, approximately 102 million drivers were answering calls and 50 million were placing calls in 2011. Commercial truckers are also concerned that new laws might limit their ability to use onboard computers. According to statements by the American Trucking Association (ATA), texting on a cellphone poses a far greater hazard than their computers do, and that their own safeguards regarding the use of in-cab fleet communication systems are more than sufficient and should not be legislated. In light of mounting evidence supporting the argument that texting while driving is an unsafe practice at best, the debate will likely heat up as new laws designed to prevent the practice are passed and adopted by more and more states. The challenge going forward lies in the successful enforcement of these laws by police, as the only current way to do so is to catch texting drivers in the act. Hopefully, through more aggressive media campaigns (like the popular Red Thumb Reminder movement), drivers will come to recognize texting while driving for what it is, a very risky practice that could needlessly put their safety and the safety of those around them in serious jeopardy.